Mike and Mary Skiver’s building burnt down on Friday night. The building was home to their tattoo shop, their apartment and their extensive tattoo history and memorabilia collection. Damages haven’t been assessed yet, but the building collapsed so the news may not be good. Mike and Mary could really use some community support right now, so if you have anything to give- please do. Current Church of Satan Magus Peter H. Gilmore is a pretty fascinating guy. I’ve been following his tumblr a while for his amazingly detailed cinema reviews (his two part review of the 2015 Godzilla remake would make a PhD thesis seem like it didn’t try hard enough) and thoughts on life and generally thought he couldn’t get much cooler. 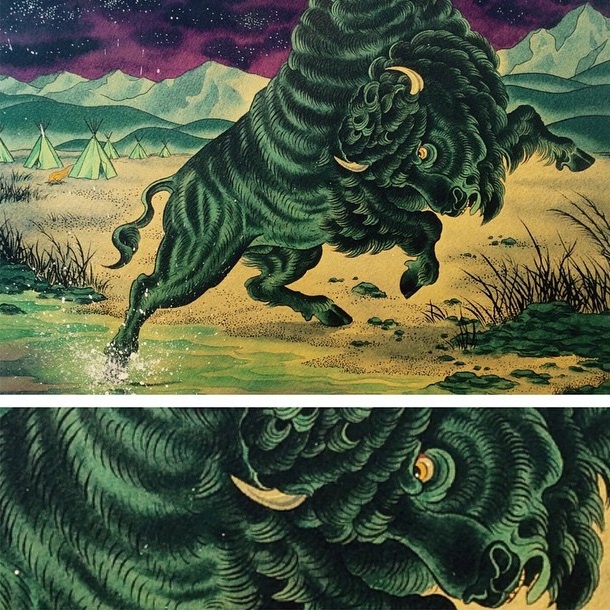 Then I saw that he was curating a show for the folks at the HOWL TATTOO Gallery down in Florida. It’s one thing to mix Satan with cinema, but when he gets his scaly mitts on tattooing it seems like it could be the perfect combination. I can’t wait to see the book! If you’re in the area you should stop by and check it out! 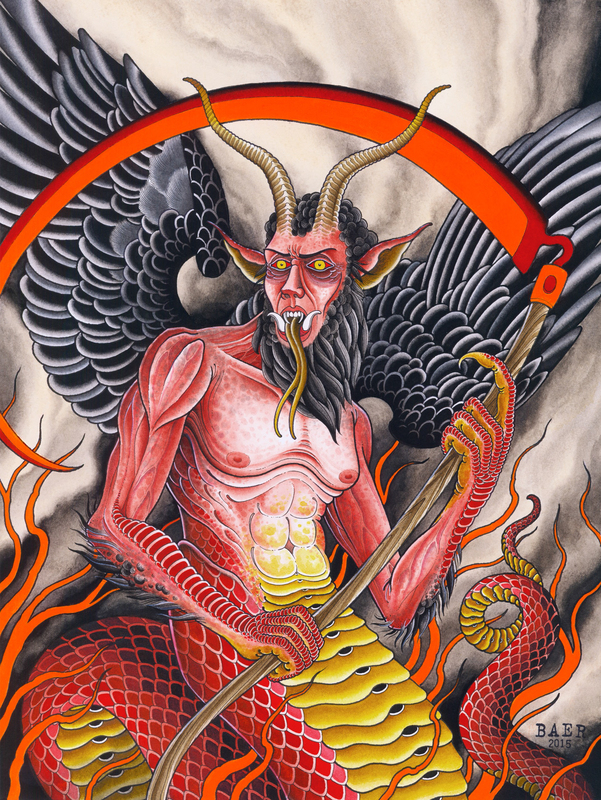 Fort Myers, FL – September 3, 2015 – Church of Satan High Priest, Magus Peter H Gilmore, has curated an art exhibition and accompanying book to both debut December 5th in Fort Myers, Florida. 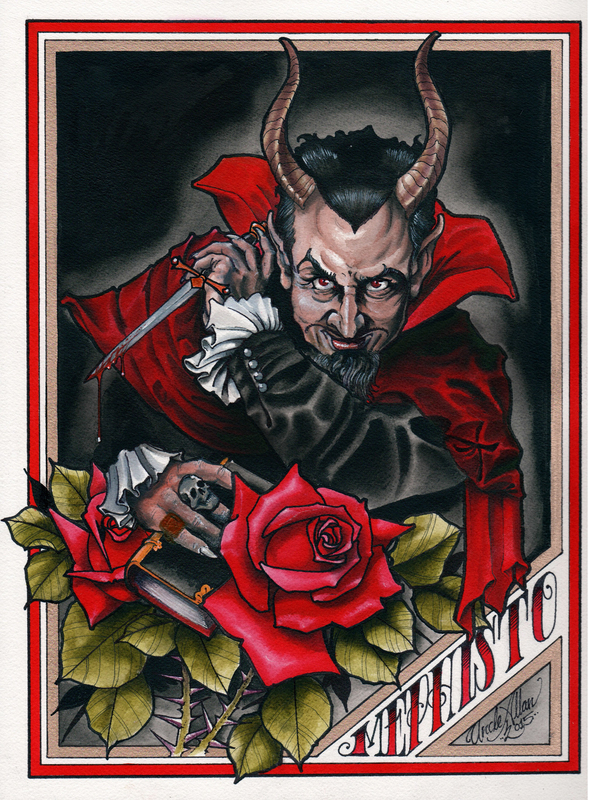 HOWL Gallery/Tattoo will host The Devils Reign, a two month art show featuring many of the world’s best known tattoo artists, as well as illustrators, photographers, painters and sculptors. The show also includes work by members of the Church of Satan’s hierarchy. Over 60 artists were selected by Magus Gilmore for the exhibition that runs from December 5th until January 30th, 2016 at HOWL Gallery in Fort Myers, FL. The limited-edition hardcover exhibition book will be available during the opening reception and afterwards. The Devils Reign features images depicting devils and dark gods from current and past cultures, as well as monstrous characters inspired by HP Lovecraft’s Cthulu mythos. The Satanic Bible, first published in 1969 and written by Church of Satan founder Anton Szandor LaVey, was used as inspiration for the exhibit. Artists referenced LaVey’s roster called The Infernal Names which features a list of more than 50 devilish deities compiled from world mythology, including Satan, Lilith, the Greek fertility god Pan, Dracula, Loki, and even Hindu divinities Shiva and Kali. This is the first show and published art book of its kind associated directly with the Church of Satan. Notable artists in the exhibit include rock poster icon Derek Hess, whose work is included in the collection of The Louvre Museum in Paris and The Rock N Roll Hall of Fame. Modern day tattoo legends Tim Lehi, Jef Whitehead, Derek Noble, Dusty Neal, Curt Baer, Uncle Allan, and Timothy Hoyer all accepted invitations to participate. Well known heavy metal album illustrators such as Seldon Hunt, Shaun Beaudry, Palehorse, and Florian Bertmer also contributed artwork. Stylistically, the works range from the gothic and grotesque to art influenced by Japanese and traditional tattooing styles. A complete list of artists is available below and on the gallery’s website. 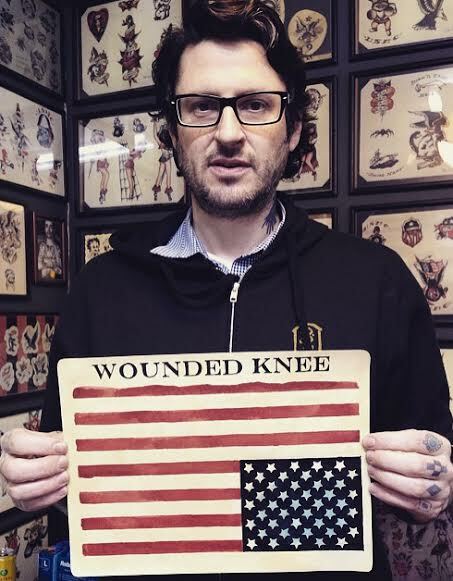 BROOKLYN, NY – Brooklyn tattoo shop Eight of Swords recently announced plans to host a fundraiser benefitting Lakota students from the Wounded Knee District School (WKDS) on South Dakota’s Pine Ridge reservation. 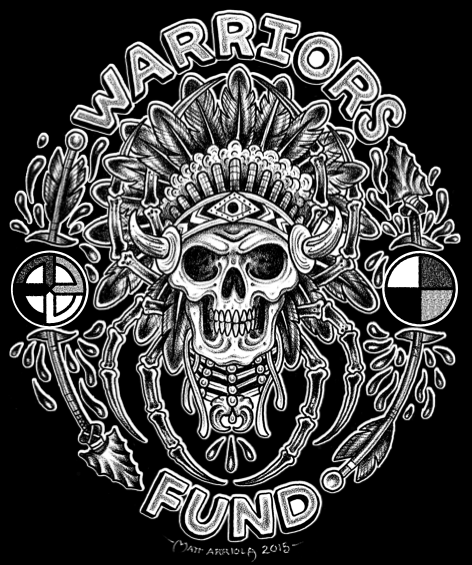 The event, called The Warriors’ Fund, is slated for Friday, March 6th at 7:00 PM and will showcase original artwork from over fifty of the country’s top-notch tattooers, including veteran Scott Sylvia of San Francisco’s iconic Black Heart Tattoo, Timothy Hoyer, known for his decidedly non-tattoo style oil paintings, and Justin Weatherholtz from King’s Avenue, one of New York’s best-known shops owned by internationally recognized tattooer Mike Rubendall. The WKDS serves 134 students ranging from kindergarten through eighth grade. Reservation schools throughout the country are often geographically isolated, contend with a severe lack of funding, and have some of the highest dropout rates in the nation. But one of the most immediate issues facing the students at the WKDS is hunger. While every student qualifies for free meals during school, the need is greater at home. Newly-appointed principal Alice Phelps has made arrangements with Feeding America in Rapid City for a monthly food distribution for reservation families. Unfortunately, the need at home is more than they can handle. With only a single convenience store on the reservation and the nearest grocery store a staggering 80 miles away, Phelps started a food pantry that she runs out of the school for families that are the most in need. That’s what The Warriors’ Fund is looking to stock. 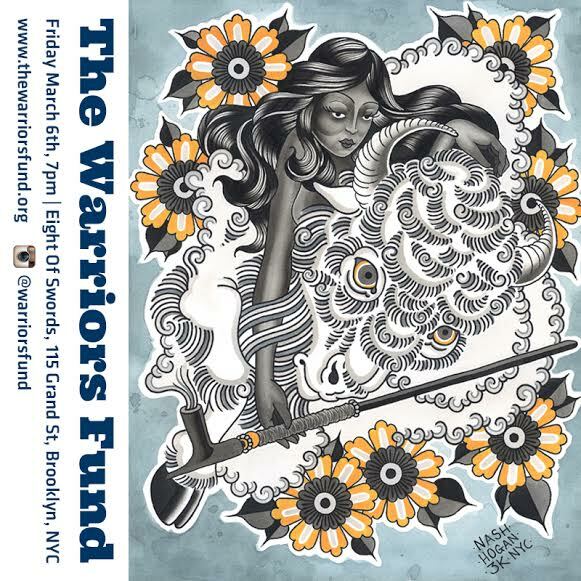 The Warriors’ Fund is being organized by Patrick Sullivan, a Brooklyn bar tender, along with tattooers Dave C. Wallin and Betty Rose, Eight of Swords’ owner and manager, respectively. Wallin, a Dallas native, has been tattooing for twenty-three years, with over half of them spent in New York. He opened Eight of Swords in 2011. Betty Rose is a ten year veteran of the business and began working at Eight of Swords in 2013. She has since helped organize previous events and is the creator of LadyTattooers.com, an online community spotlighting women in the tattoo industry. 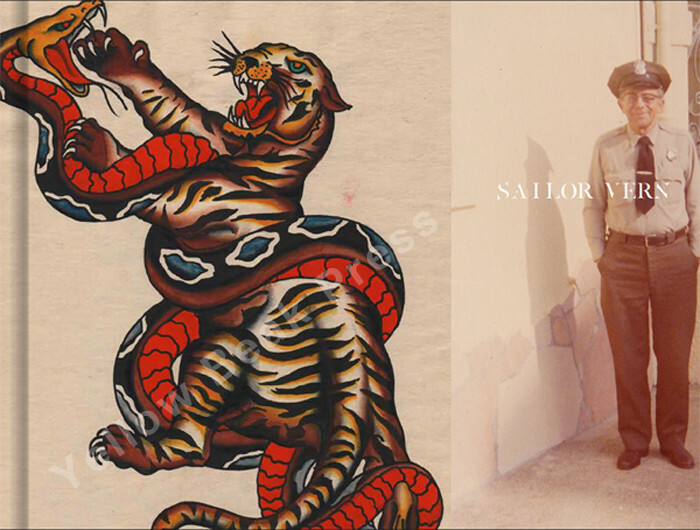 Pre-orders have gone live over at Yellow Beak Press for their latest offering- SAILOR VERN. An upcoming biography: Sailor Vern Ingemarson, a tattooer for 30+ years, was a disciple of Cap Coleman. In the 1940s, he started his career working alongside Coleman and Paul Rogers in Norfolk, VA and later worked with Duke Kaufman in San Francisco. This book contains never before seen flash, acetates, photographs, and line drawings from Sailor Vern, Duke Kaufman, Cap Coleman, Paul Rogers, Percy Waters, and many more. Yellow Beak consistently puts out the best tattoo history books on the shelves, so jump in early and get yours secured!